I start my day with a coffee, a strong Turkish coffee without sugar – it is the stuff that makes the chest hair grow, as one UK friend of mine has put it. The next thing is starting the computer to check the news. And the first news web site is… eBird. I go to the Hotspots page to click on the Past week only, to see which reachable Belgrade sites – especially my favourite patches – were recently visited and which birds were spotted there. 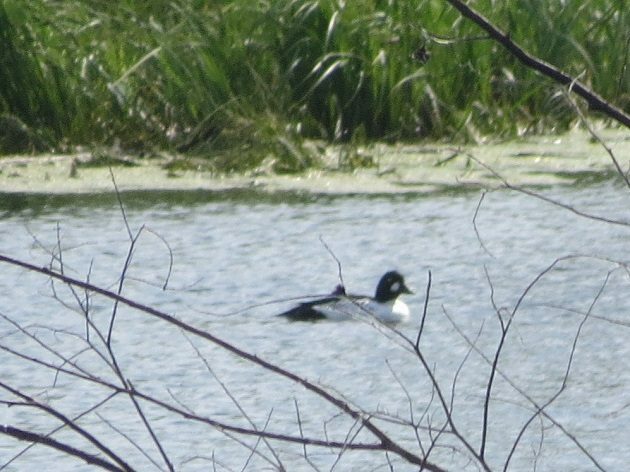 A Common Goldeneye in late May?? They do not breed, only winter here! Yet, one female has been found at Reva floodplain and one male at Beljarica backwaters, some 15 km apart along the Danube? What are they doing this far south at this time of year? Widespread across northern regions of northern hemisphere, they breed in Arctic-Alpine forest zone. Interestingly, up to the mid-20th century, they did breed in the mountains of Montenegro, at 1400 m / 4600 ft, before the tourism development of the area, but Belgrade lies in the lowlands (at 70 m / 200 ft). Yet, in the north, they occupy Black Woodpecker cavities, and BWs are becoming ever more numerous here and adapting to disturbed habitats. Are Goldeneyes adapting, too? Unlikely, but the question what are they doing here remains. 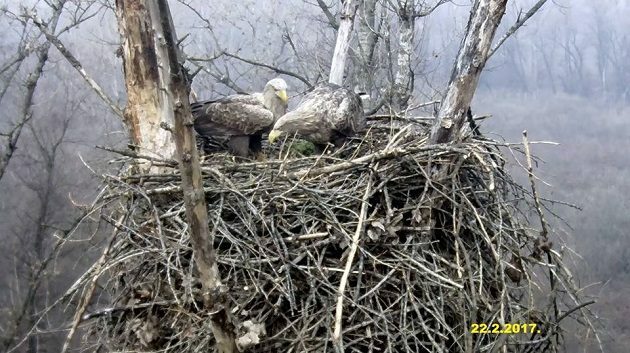 The next web site is Youtube and the White-tailed Eagle nest cam (cover photo from February) at an island nature reserve, the Veliko Ratno ostrvo in almost downtown Belgrade – my favorite canoeing turf. Even if you know nothing of this species, you can tell the eaglets from their parents: youngsters have black hair, while their parents are all grey by now. 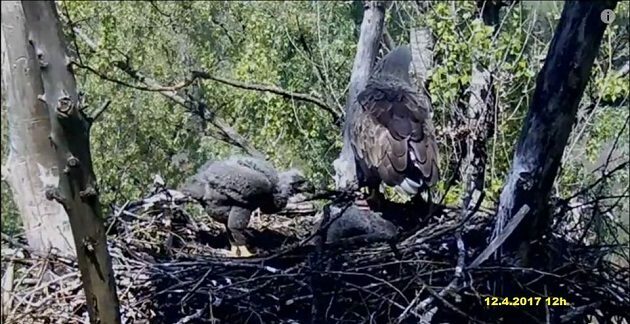 By late May, the eaglets are already big teenagers, active in redecorating their home and hungry, demanding ever more food, which makes this period particularly interesting to observe. 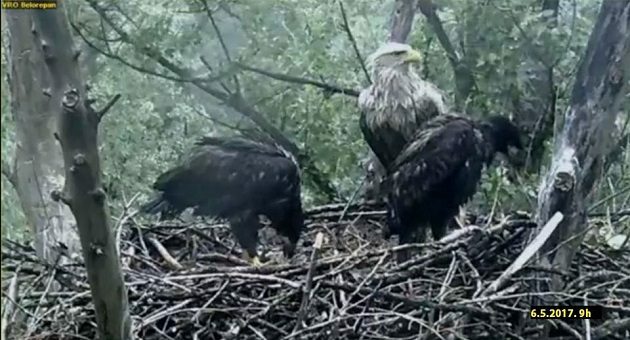 This pair has moved here from the opposite bank of the Danube when foresters started to cut down the poplar plantation they were nesting in. Canoeing by it, I noticed how dangerously close to the nest they came, 40 m / 130 ft, and called the inspection which prevented further tree felling in the vicinity, but the core of the plantation remained exposed. The following year, strong easterly winds broke down the tree that gave too much resistance, the one with a large nest acting like a sail against the wind. And the birds moved to the island. Their first two seasons at the island were unsuccessful. They lay eggs in late January or early February, and the Statehood Day of Serbia is in mid-February. That year, it was celebrated with jet fighters in low flight above the Danube. And the island. And the new nest. Frightened parents took flight, to the delight of photo reporters, but exposed eggs did not survive winter cold, or hungry magpies, whatever came first. The next spring had a prolonged period of abnormally low rainfall, leading to very low water levels and dried up backwaters in a fish spawning season. White-tailed Eagles rely on fish as a staple diet for their offspring and that clutch failed. Only their third island season was a success. 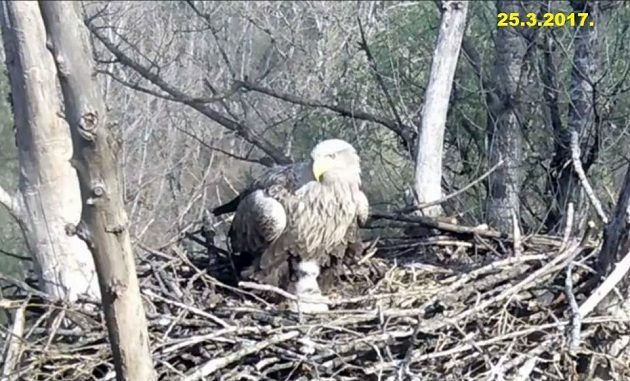 A month ago, they brought a carp to the eaglets. Careful nest cam viewers noticed that with it, one chick has swallowed a hook, leaving a line to hang from its beak. And it is not possible to climb the nest without destroying it. The nest is in an old, dry poplar tree, held by dead branches of which two are dangerously narrow. Basically, there was nothing anyone could do to help the bird. Hopefully, the unfortunate eaglet may have managed to regurgitate the hook since both of them seem fine now, but it is possible that the hook is still stuck somewhere in its intestines. And there are loads of lost fish hooks and lead weights along the river, most often seen on tame Mute Swans and Mallards. In a few short weeks these eaglets will leave their nest, but remain in the neighbourhood for a month or two more, till the end of summer, still awaiting their parents with food while learning to fly and hunt for themselves. And the “regular” news sites? Oh, who cares! Very interesting and sad story… sometimes I think it’s a wonder any birds survive! Thank you for watching out for them. It’s good to know there are people everywhere who care about birds.